In the modern age of rugby, there is much to be said for constructing a game plan for your opposition. Much has been made of the benefits of video analysis, and it is a well-known fact that every team in the professional age now spends much of their time completing and digesting analysis of both themselves and their opponents. This is something for which Joe Schmidt has become renowned for. For numerous years it was believed that there were a multitude of variables, far too great to counteract, in the world of rugby. I am ashamed to admit that up until a few weeks ago, I would have been one of those naysayers. What changed my mind was an interview which was conducted on Second Captains Live with both Andrew Trimble and Fiona Coughlan, the former Irish Women’s team captain. 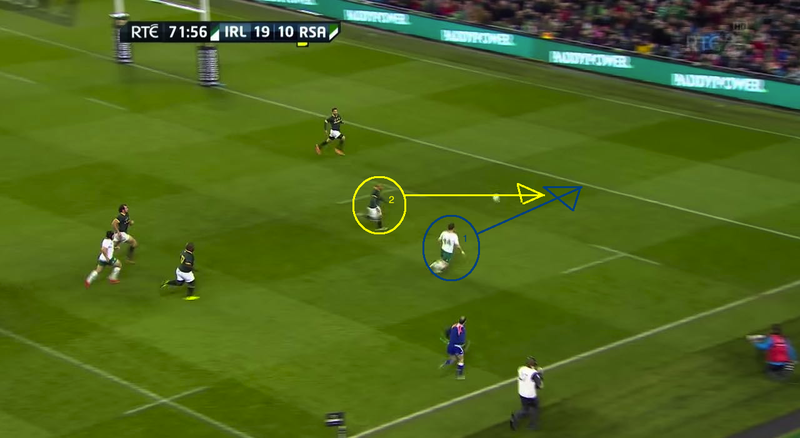 In this interview, the questions about Joe Schmidt’s attention to detail were raised, whereupon both Coughlan and Trimble gave telling examples which demonstrated the lengths Schmidt goes to in his drive for perfection. Firstly, Coughlan described how Schmidt and Les Kiss took a women’s training session just prior to the WRWC last year (one in which the women did this country proud by not only beating the All Blacks, but by getting to the semi-finals and ultimately finishing 4th!). Coughlan described how she and her teammates expected the session to proceed, with the majority of the players anticipating it to be a mere pep talk, followed by a “going through the motions” exercise that would ordinarily be associated with an outsider taking a one-off session. In actual fact, what occurred was far different. Coughlan recalled how both Kiss and Schmidt had gone to a few warmup games in the lead-up to the session and had conducted their own analysis on areas of the game which the squad could work on. They consequently proceeded to take the session, and guided the squad through minor adjustments and improvements which they felt could be made. This alone shows the sheer professionalism of the man himself. That he would even take something so simple as a single training session with a squad which wasn’t his own so seriously demonstrates this absolute attention to detail for which he is renowned. The fact he and Les Kiss went out of their ways to go to games beforehand, conduct analysis off their own bats, and subsequently base the session (which was no doubt meant to be just a bit of a morale boost ahead of a World Cup) around his findings speaks absolute volumes for the man who is going to lead us in to the World Cup in 2015. If he goes to these lengths for a single session with a team that isn’t his own, one can only imagine the amount of time he and his staff spend focussing on plans and ideas with his own team in mind! Afterwards, we were treated to an insight from Andrew Trimble, who focussed on Tommy Bowe’s game-killing try in the final minutes of the match against South Africa. 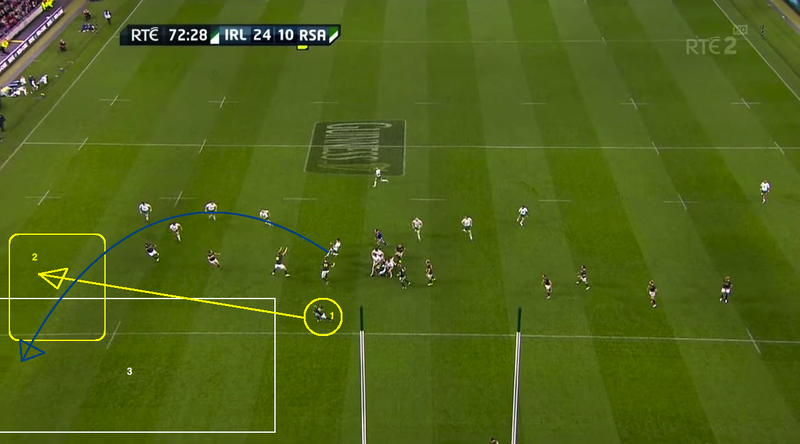 Trimble revealed that Schmidt had developed a plan, knowing exactly where both Habana and the scrum-half would be. He went so far as to say that the squad had invariably rehearsed that very scenario in training in September, trusting what Schmidt had told them, knowing and believing 100% that the schoolteacher was going to be proven right. Something I didn’t pick up on at the time, as I was too busy sending ferocious texts and simultaneously shouting the Ryle Nugentism that is “Tommy Booooooooowwweeee,” was Shane Horgan stating exactly what Trimble subsequently revealed. Shaggy told those of us who were listening to him (something we all struggle with at the best of times) that it was a pre rehearsed move, and that the space vacated by Habana was no mere coincidence. Shaggy divulged that this wasn’t an act of chance or instinct, but one which had been drilled in to the players over and over by the crafty perfectionist and his diligent backroom team. Let us take a look at that exact piece of action. 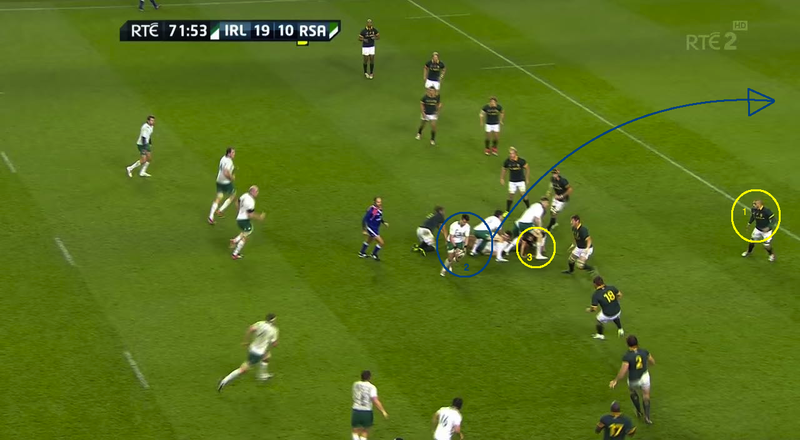 Here, both the scrum-half and Habana are circled, and all seems to be in order in the ‘Boks defensive system. The scrum-half (1) has elected to shoot up and close Sexton (2) instead of sweeping into the white area behind his defensive line as is normal. Habana (3) has also started moving infield, instead of sticking to his touchline. It appears that the system employed by Meyer is one where the blindside wing sweeps behind and scrum-half joins the line. The scrum-half makes the tackle on Sexton (3) , Ireland recycle quickly and Murray (2) doesn’t even look up, he knows the space is going to be there with Habana caught so far infield (1). 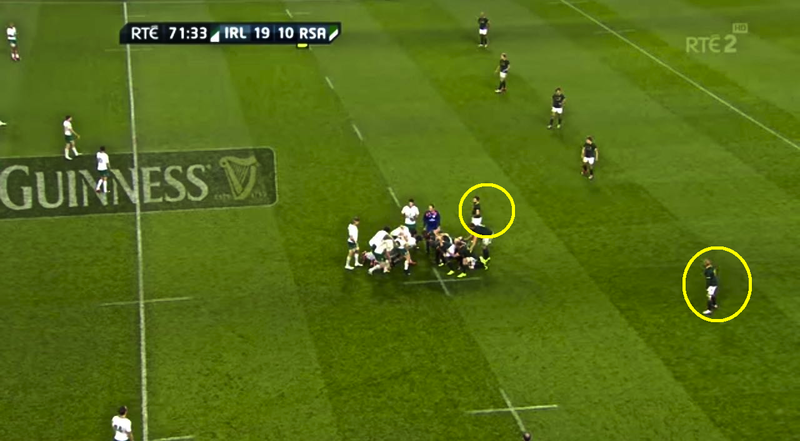 Habana is at sea (1) in the middle of the pitch instead of adopting a wide defensive role (2). Murray has acres of space to kick in to as a result (3). Bowe (1), who was out of the picture, knows exactly what Murray is doing and since Habana started so far infield (2), instead of covering the touchline (2)(a), he is left with too much to do. It is clear here how the ‘Boks fate is sealed as the ball (5) is already well ahead of Habana (3), who has an enormous amount of ground to make up to get to where the ball will land (6). Habana and the ‘Boks defence have left themselves with too much to do, Murray’s kick is on target and Bowe(1) simply has to gather and fall over the line, with Habana’s only hope being that of a desperation tackle on Bowe (2), one which in this instance couldn’t prevent Bowe dotting down for the game-killing score. The defensive system used by Meyer and the Springboks is designed to prevent the attacking team from gaining ground, breaking the line or offloading in midfield, by clogging that area with numbers. 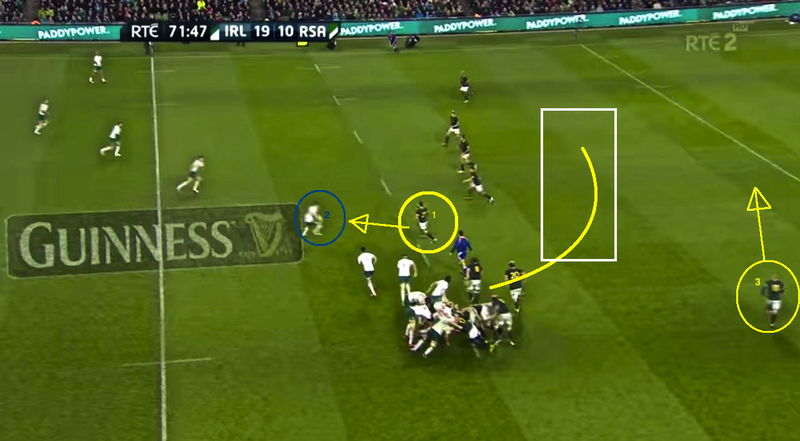 The above 6 images show that not only did Schmidt spot the one minuscule weakness in the way the ‘Boks defend this scenario, but he implemented a plan to take advantage of that weakness. With absolute perfection, his players followed “the word according to Joe” and executed the plan in a ruthless, clinical fashion which us Irish supporters are unaccustomed to. My view towards Schmidt as a perfectionist who plans for everything can be highlighted yet further when Trimbs divulged that even off turnovers and other unstructured aspects, where there is a chance for the players to execute something off the cuff, the mild-mannered man from an inconsequential village in New Zealand is still the one pulling the strings. Even in these situations he is dictating how his charges should and will react. 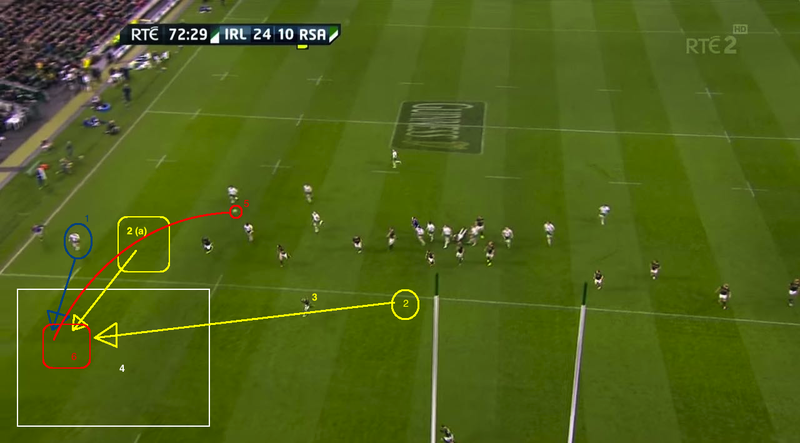 Essentially, Joe Schmidt has a plan for everything, even the unplannable. The respect he has commanded from both his players and the wider rugby community is unparalleled. The fact that he led an Irish team to a Six Nations title in a year where we were obliged to play both France and England away was a marvellous feat for the meticulous, unassuming Kiwi. The way he has coached his side and dissected opponents to find their flaws should have surely led to at least parity with Steve Hansen, who just recently won coach of the year. While the All Blacks have been dominant again, the improvements made by the Irish under Joe Schmidt surely should have warranted recognition from World Rugby (formerly the IRB) in the form of the coach of the year award. It is probably best to leave a discussion on the shortcomings of that particular organisation to another day. Our time with Joe may be limited though, and unfortunately nothing good lasts forever. It wouldn’t be an Irish rugby article without a piece of partial negativity after all. Schmidt has a contract with the IRFU until 2016, and there is of course a Lions tour to his homeland in 2017, a tour he must surely be the favourite to lead. Truth be told none of Gatland, Lancaster or Cotter are more competently suited to the challenge of defeating the All Blacks in their own back yard than our man Joe. It is safe to assume that although he has a love for Irish rugby, given that his first club and international head coaching jobs both came on this island, home is ultimately where the heart is. There is no doubt in my mind that he will coach the All Blacks soon, and who could blame him if he ultimately decides to? But for now, we might aswell take pleasure in the moment and admire the work of a genius and his charges. This, and not the Eddie O’Sullivan years, are truly the golden age of Irish rugby and there is no longer a sense of underachievement and failure surrounding the team, but one of optimism and belief. There is a real sense that the World Cup in 2015 is our chance, that it is our time to finally emerge as one of the dominant forces in World Rugby. What last Autumn showed us was that we can live with the All Blacks, and an article published today on the All Blacks own website at the conclusion of the Autumn Internationals shows that the success of the Irish under Schmidt hasn’t gone unnoticed. The author seems almost thankful for the fact that they didn’t have to play us at the weekend. It may just be me, but I get the sense that they are finally starting to show us some respect. While many will still believe that Ireland are better suited to being the plucky underdog in the games against the top nations, it is about time we adopted a different attitude, one which Schmidt has done his best to reinforce, and that is the attitude that we deserve to be held up alongside the upper tier of rugby powerhouses. I for one now stand firmly aboard the bandwagon, and the onset of Rugby World Cup 2015 is eagerly anticipated and quite simply cannot come quick enough. The days of winning the big games purely through passion are long past, and have been replaced by this new cool, calculated, accuracy-based approach of the Kiwi schoolteacher showing his pupils the way forward.